To some people, I'm known as being a bit of a browser snob. I've been an Opera fan for many years, and one of the things I like to do, is poke a little fun at Firefox fans. If only it were true. Security and Stability I will come to later, but it's the issue of speed that will be addressed this time. I usually use a combination of Chrome and Opera. Chrome is used for 'short term' things, checking a few blogs, and playing videos on Hulu. For the majority of my work, I use Opera. I do, however, have Firefox installed on my systems, along with, obviously, IE. To start with, I've benchmarked the two systems that I use most often (there are another few systems that are also used, but which are 'in use' and can't be reset for this test), my main desktop, and the wife's laptop. 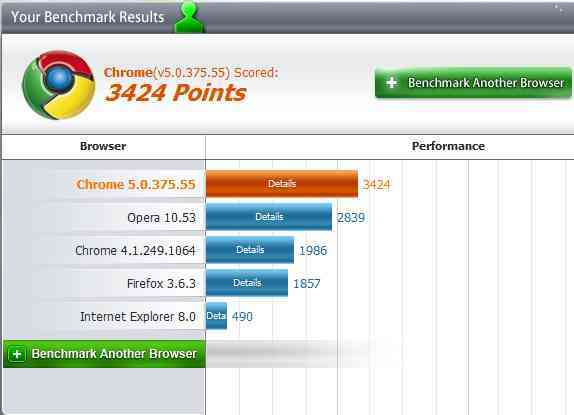 The benchmark used was Futuremark's "Peacekeeper" browser benchmark, which focuses on the newest aspects of a browser, the specific areas tested are explained on the FAQ under "What are the individual tests?". Each test was run twice, with the systems cleared of other programs. Both systems were run using 'high performance' power settings and were run in a different order the second time around to ensure that data/access from a previous browser was kept to a minimum. There were then two additional tests made. 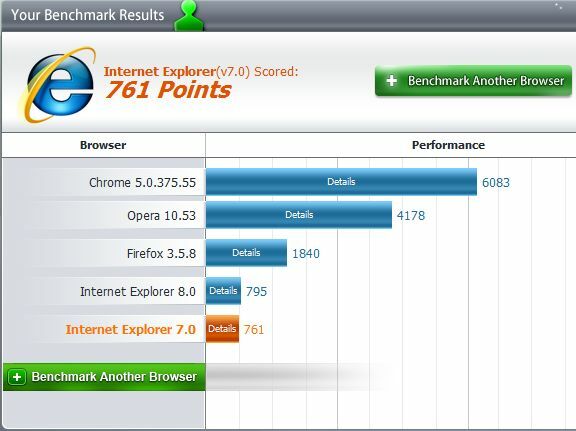 On the desktop, the test for Internet Explorer 7 came via the browser inside the RSS reader Snarfer. On the laptop, chrome was updated to the latest version and the test run once. If there's one thing that can be made clear, when it comes to speed, contrary to their adverts, it's certainly not Firefox you go to. It was soundly trounced by both Opera and Chrome. At the same time, while Chrome is (with it's latest version) quite a bit faster than Opera, it is also 'light' on features, and they have to be added separately via plugins/extensions (just like Firefox). Either way, there's very little need to go the Firefox route.